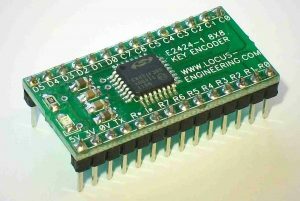 E2424 64 Key Encoder | Locus Engineering Inc. The E2424 64 Key Encoder allows up to 64 normally open keyswitches in a 8×8 matrix to be encoded without external parts. This module simplifies the software overhead of the host microcontroller and reduces the I/O pins needed from 16 to one. Keys are fully debounced with no false outputs regardless of any other combination of keys pressed. Keys are encoded on the make of the key with a response time of ~50msec due to a high speed scan of the keyswitch matrix and a unique debounce algorithm. An LED flashes each key closure and a typematic function is also included. Outputs include a parallel 6 bit port, a 57.6 Kbaud serial port, and an interrupt signal making interfacing easy. Power is +2.7V to +5.2V. Custom baud rates are also available.